We have a strong background in television production and we produce create high quality, creative content across multiple platforms. 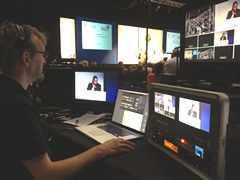 Using a multi-camera set up with live vision mixing, we record a master file and also send a live video stream to our video server and the internet. Copyright © 2019 The Pixel Bunch. All Rights Reserved.